Before we even start, I want to point out I deserve zero credit for this next idea. All of the following insightful observations are brought to you by Adam Collins of Movement Capital. Adam’s work on COT data is second-to-none and he is a must-follow. Over the past few months I have struggled with a glaring inconsistency. 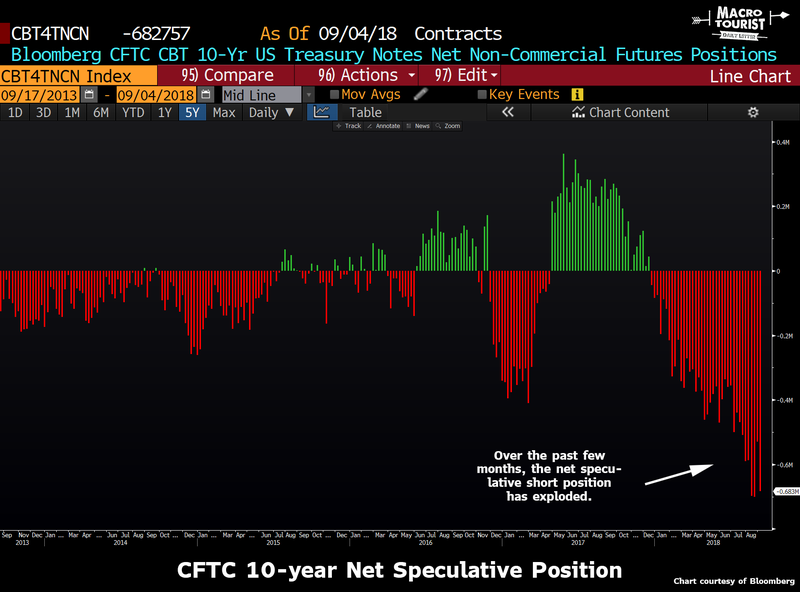 The CFTC’s Committment of Trader’s (COT) data for the 10-year US treasury note has displayed a large increase in the size of the net speculative short position, yet this is at odds with what I observed in terms of market sentiment amongst traders and portfolio managers. This increase in speculative net shorts has pushed it to a record position. The bond bulls point to this new record short position and ominously label it the “Big Bond Short” that will be bought back in the coming quarters when the US economy implodes due to the inevitable deflationary bust. Some derivation of this chart with the smart-alec caption “this will end well LOL” fills my twitter feed every day. And herein lies my problem. The CFTC data does not square with my anecdotal evidence of market positioning in the US bond market. I don’t see a preponderance of bond bears pushing their luck with massive short positions. In fact, it appears that the speculative community is erring more on the long side. Poll your global macro hedge fund manager or your local independent trader, and dollars-to-donuts, they will most likely be long US fixed income - not short. The most common held belief is that the Federal Reserve has tightened into the next recession with the economy about to roll over. Some of the more high profile leaders of this school of thought are Raoul Pal or David Rosenberg. And this camp has consistently used the COT data as a reason for their bullishness. Yet, they are not lone wolves bravely fighting off the mindless shorts, but I contend instead represent “fast money” consensus. Contrast all the calls to buy bonds to the recommendations to lean on the sell button. 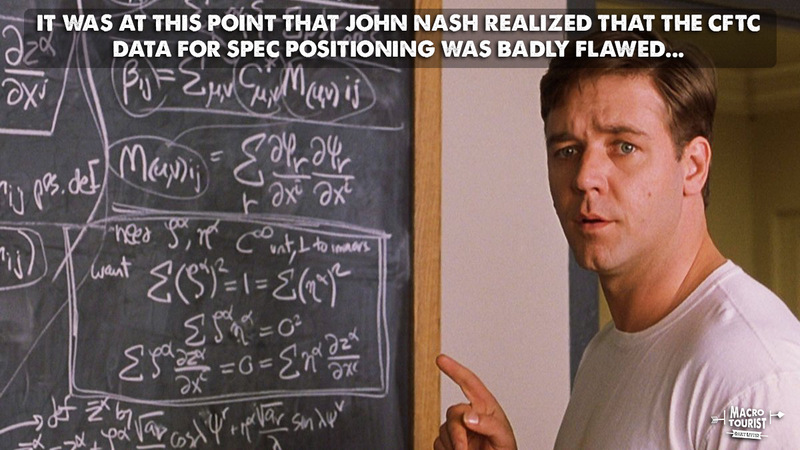 Name me one big-time-bond-bear who is claiming you should be pushing your short in here. I don’t know about you, but I can’t think of a single table-pounding-bear. But how does this fact square with the COT data? 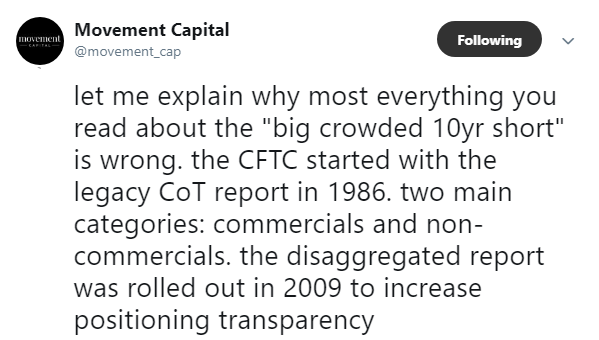 Adam has taken the time to understand the breakdown of the CFTC report as opposed to merely grabbing hold of a generic graph of speculators versus commercials because it fits into a partciular narrative. Be careful getting long US bonds because of the “Big Bond Short”. 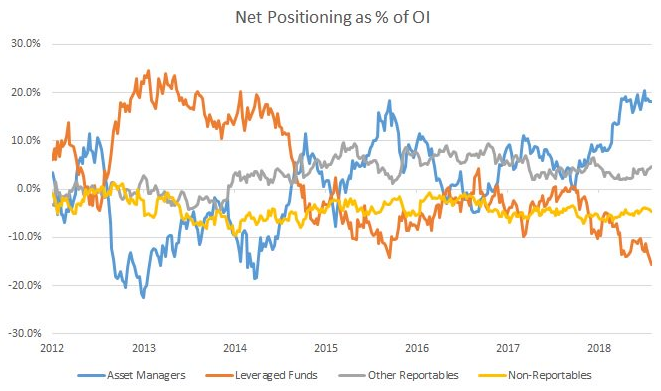 Yeah, maybe we are due for a rally, but asset managers are already well positioned for a rebound. 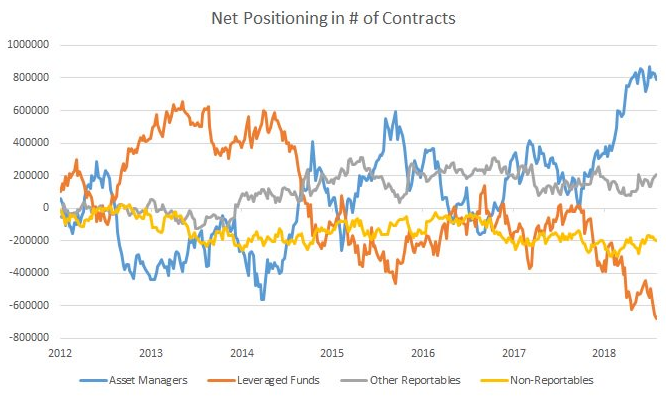 Now, I can hear the cries of protest already - “the leveraged funds are net short record amounts and they are weaker hands so we are still due for a short covering rally.” For sure - I am not disputing that fact one bit. But there is no doubt that the “Big Bond Short” is nowhere near as large as the bond bulls are leading everyone to believe. Adam’s terrific analysis meshes so much better with my anecdotal observations that many market participants are leaning long - not the other way round. 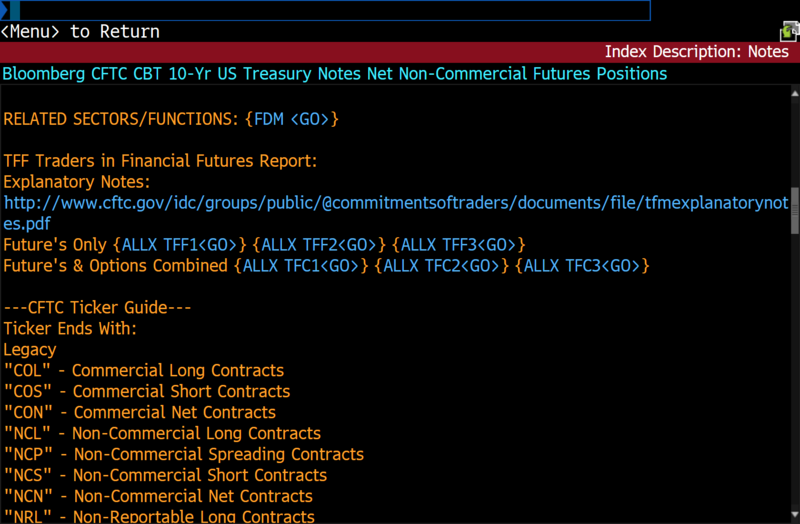 PS: For Bloomberg users that want some help on finding the more nuanced CFTC data, I have tracked it down. In the old days I would merely type CFTC and then punch in my commodity/future that I wanted to analyze. It was simple and straightfoward. Getting the new data is not quite so easy nor straightforward. See those commands for “Future’s Only”? Try typing ALLX TFF2 GO. 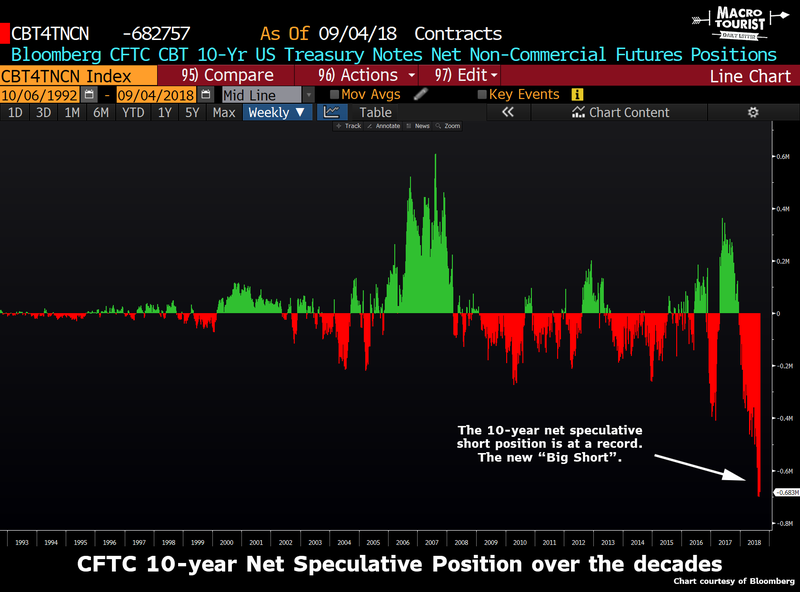 Number 207 is the Asset Managers Net Position for 10-year T-note futures that Adam referenced.